As Florida adds additional miles of multiuse trails each year, they are increasingly attracting a variety of bicyclists, including families and children. Not all of these young riders are well supervised or have any training in safe riding practices. Collisions involving cyclists and pedestrians, no doubt, will continue to rise. May someone be held responsible if a child riding a bicycle injures a cyclist or pedestrian? It's interesting to understand that as a child gets older he or she is capable of being found negligent in their actions. A jury must determine whether the child was mature enough to understand the risk and responsibility for their own actions in order that the child be found responsible. For younger less mature children, these claims will typically be brought against the parents. Whether a child is found individually responsible or the parents are held responsible for the child's conduct, the endgame is bringing in the coverage afforded by the parents' homeowners insurance. Not only are parents considered to be the insureds, but resident relatives in the home may be covered as well, as long as they are found to be mature enough to be held liable for their own actions. In crashes caused by a young child, one of the most common theories alleged is negligent supervision of the child, although there are other potential theories as well. There is a reported decision in Florida going back to 1973. In this case, a five-year-old child on a bicycle collided with a 79-year-old pedestrian who was injured. The parents were sued for lack of supervision. The evidence indicated the child had ridden a bicycle for only a month and had been without training wheels for only a week. A jury found the parents responsible under a negligent supervision theory and the appellate court affirmed the decision. I've written about this topic because it applies to us both ways. 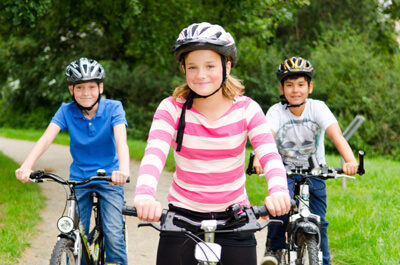 Many of us as parents and grandparents will have the opportunity to supervise a small child on a bicycle, whether in the neighborhood or on a trail. It is good to keep in mind the responsibility we're undertaking. Additionally, we receive more and more calls from people who have been injured on a trail, whether in Sanford, Fort Meyers or any Florida city in between, because of the alleged negligence of another person on a bicycle. Many of these injuries are quite severe even though the collisions occur at relatively low speeds. Someone who has been hurt will be looking for every opportunity to be reimbursed for their medical expenses, lost wages and for the harm they have suffered.